This Competition closes for entries via telephone call and text/SMS at 10am on Monday 8th December 2014. Competition closes for postal entries at 5pm on Thursday 11th December, 2014. 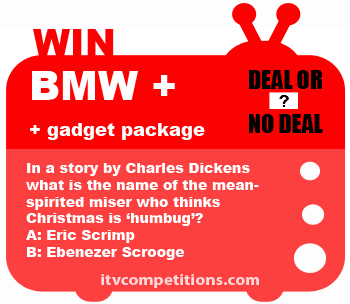 In a story by Charles Dickens what is the name of the mean-spirited miser who thinks Christmas is ‘humbug’? You can enter this competition by phone call, sms or postcard. Postcard is cheapest method.